Growing avocados outdoors s productive fruit trees can be tricky, but growing them as houseplants is fun and easy. If you have enough patience, your seedling will eventually turn into an attractive little specimen with glossy, oval leaves 4 to 8 inches long. True, it's unlikely your tree will ever bear fruit (unless you give it about 10 years), and even if it does, the fruit from the offspring most likely won't resemble the original. But as an decorative indoor plant, an avocado has plenty of merit. Soil Type: General-purpose potting soil; in the landscape, it likes rich, loose, evenly moist, well-drained soils. When avocado is grown as a houseplant, it is often grown from seed (the fruit pits) that can be sprouted in water or directly in potting soil. Established plants will do best in sunny windows. Fertilize them regularly in spring and summer with a balanced granular fertilizer. Avocados grown indoors are mostly novelty plants. If you want it to bear fruit and turn into the tree it really is, you'll have to move your avocado outside (and perhaps move yourself to a warmer climate). Like bananas, avocado plants thrive in full sun. They will tolerate some shade, but potted indoor plants generally need the brightest spot you can find. If you're starting from a seed, the seed can be kept on a bright windowsill until roots form, and the first leaves emerge. Avocado plants should be kept continuously moist, but adequate drainage is essential. Watch for leaf yellowing, which is a sign of too much water. Also, be careful to flush fertilizer salts from the soil. Avocados prefer warm growing seasons, but can take winter temperatures down to 50 degrees Fahrenheit, when growth will slow. A rich, fast-draining potting soil mix is ideal. Fertilize abundantly during the growing season with a balanced fertilizer. Fruit and vegetable fertilizer can be used after a few years when the plant is larger and nearing fruiting. Avocado can be propagated in a number of ways. Professionals graft desirable avocado varieties onto disease-resistant stems to produce a disease-resistant tree with the desired kind of fruit. They can also be propagated by air-layering—a process of encouraging roots to grow by scarring a tree branch, wrapping the wounded area with a small amount of rooting medium, and allowing a bundle of roots to develop while the branch is still on the tree. Once a network of roots are developed, the branch is snipped off and planted in soil. In the home, the most common method is by seed. To sprout an avocado seed, insert three toothpicks into the seed and suspend it with the end down over a glass of water. Cover about an inch of the seed with water. Keep it in a warm place, but not in direct sunlight. The seed should sprout in two to six weeks. Let the young plant grow to six inches, then cut it back to three inches to encourage stronger root growth. When the new leaves have emerged again, plant the avocado in a pot with soil. 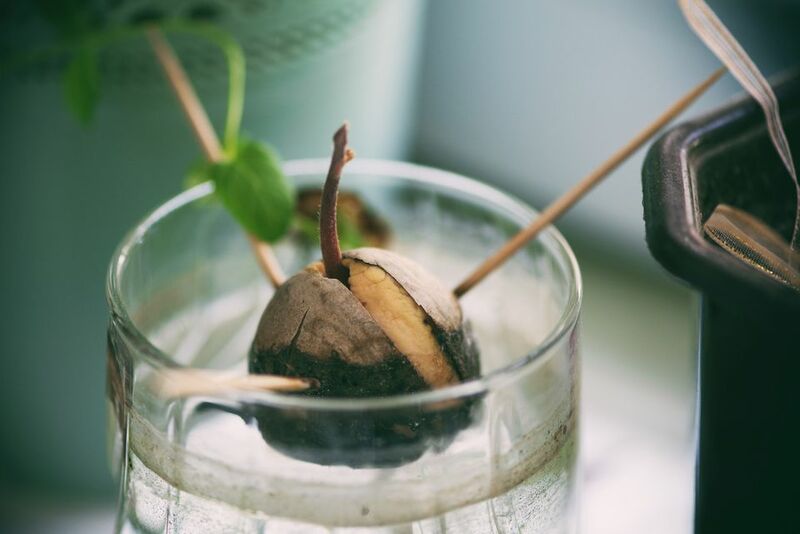 Repot your avocado every spring when the plant begins to grow again. For the first few years, trimming your avocado is necessary to encourage a bushy plant. The first serious trimming should occur when the plant is only 12 inches tall. At that time, cut it back to 6 inches and allow for new leaves and stems to form. As it gets taller, pinch off new growth throughout the summer to force new branches to form, because avocado fruit develops on new growth. Keeping the new growth pinched off will also keep the plant bushy while controlling its size. Although there are about 1,000 varieties of avocado, the one most likely to find its way into your home is the Haas avocado, which is grown in tremendous quantities in California and throughout Latin America. These are small, pebbly avocados with high-fat content and delicious flesh. Larger, lighter green Florida avocados are also found in season. These have less fat and are sometimes marketed as health-conscious avocados. Look for symptoms like leaf yellowing, which can indicate too much water or sluggish drainage. They may develop root rot in overly wet potting soil. Also, keep an eye out for a white crust on the soil—this means an excess of salt build-up from the fertilizer. Flush the pot regularly. When grown outdoors, avocado trees are threatened by laurel wilt, caused by the Raffaelea lauricola fungus. It is transmitted by several different species of ambrosia beetle. Infected trees usually succumb within 4 to 8 weeks.